A king has been dethroned through unfair means and a new reign of terror is in place. The rightful heir is unaware of his true potential. The suffering masses are waiting for the leader to find his calling and save them from an atrocious regime. The women are enslaved and are hopeful that one day, their leader will take the plunge. And the leader pays repeated obeisance to his mother and takes a sabatham to avenge her humiliation. This isn’t a description of present day Tamil Nadu. This was MGR setting the tempo prior to his departure from the DMK through his blockbuster Adimai Penn. It was by chance that I got to know about the re-release of this movie, in Escape Cinemas. The movie, originally released in 1969, was a phenomenal success and close to five decades later, it seemed to have beaten the rate hike blues in the cinema halls. On a Sunday morning, it was a housefull show. Fact, fiction and political mythology have often come together in the melting pot of cinema. Every superstar film has a format and Adimai Penn sticks to it. There’s ‘lost and found’ in the backdrop of a palace intrigue. There is the constant hope of the arrival of a thailavan who will redeem the masses, mirroring the swelling public support for MGR by the late 1960s. 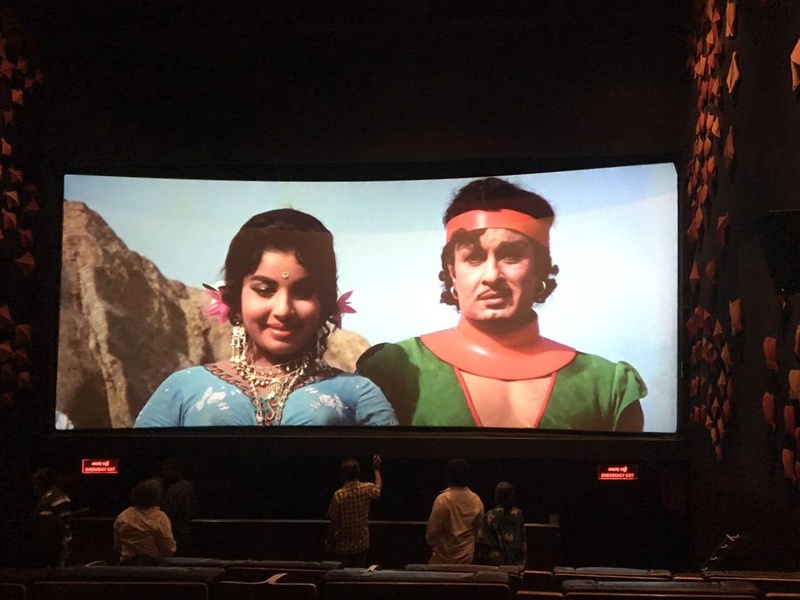 While MGR’s entry was obviously met with a huge applause in the cinema hall, it was quite a sight to see the theatre break into raptures when Jayalalithaa appeared on-screen. Between 1969 and 2017, for good or bad, Jayalalithaa the entertainer had become Amma, a leader who is now missed in a leaderless state. In an early scene in the film, Jayalalithaa points to the udayasuryan (rising sun, also the party symbol of the DMK) and asks MGR to bow before it for it is their life-giving God. This is just the first laced message in a litany of DMK propagandas the viewers encounter. Jayalalithaa even does playback in the song Amma endral anbu (a remarkably good rendition), branding her own future image unknowingly. There is also a glowing tribute to motherhood picturised on MGR and Pandari Bai in Thaillamal nanillai; it was quite another sight to see viewers sing along with MGR in the cinema hall. In another scene, Jayalalithaa orders the followers to fall in line or face the wrath of MGR, quite a premonition of the role she would play later while being the propaganda secretary of the AIADMK. Why, the followers even lose faith momentarily in their leader, for he has fallen for the charms of a woman (Jayalalithaa in this case). In her double role as the haughty queen Pavalavalli, who believes she can always have her way, Jaya also shows glimpses of the unforgiving autocrat she would be after assuming power. RM Veerappan was the producer of this movie and also contributed to the story. It was all ironic when in real life he deemed Jayalalithaa a bad influence on MGR and even supported the Janaki faction after his death. In hindsight, Adimai Penn emerges as a Jayalalithaa film and its release at a time when the AIADMK’s popularity has touched the trough, is no mere coincidence. But why take the film away from MGR, the man who produced it for himself. He even supposedly fought a real lion in the climax scene! He talks to the masses directly in a cinema hall, through his songs and dialogues. For that matter, even the item song Yemmattraathe is a propaganda song, aimed at the opposition. At this juncture, it should be compared with yet another blockbuster Aayirathil Oruvan (1965). Here, MGR chooses not to rule but install the right ruler. Aayirathil Oruvan came a good two years before Annadurai became the chief minister. But in Feb 1969, Annadurai had passed away and in Adimai Penn, MGR takes over the kingdom that is rightfully his. He had announced his ambitions on-screen and his followers got it right. It was no mere accident that he had a successfull innings in politics. He wasn’t an actor who stepped into politics but a politician who donned the greasepaint. It also explains why none after him have been able to replicate their box-office success by the ballot box and perhaps never shall.